7 Awesome Stats from NFL Week 14 - Fantasy Football, Fantasy Football Rankings | Mac Bros.
Week 14 of the NFL season has nearly come and gone. Let's look back at 7 feats of statistical awesomeness. 1. The GREEN BAY PACKERS improved to 13-0 with a 46-16 win over Oakland. The Packers, who are the second defending Super Bowl champion (1998 Denver) to start the following season 13-0, have won 19 consecutive games, including the playoffs. That is the second-longest winning streak in NFL history, trailing the 2003-04 New England Patriots (21 games). With the win, the Packers clinched a first-round bye. The Packers’ 46 points give them a total of 466 for the season. That is the most in franchise history (461 in 2009). Green Bay quarterback AARON RODGERS passed for 281 yards and two touchdowns. He has thrown for at least two touchdowns in 13 consecutive games, tied for the longest streak in NFL history with DON MEREDITH (1965-66), PEYTON MANNING (2004) and TOM BRADY (2010-11). Rodgers has 39 touchdown passes, tied with BRETT FAVRE (1996) for the franchise’s single-season mark. 2. The NEW ENGLAND PATRIOTS defeated Washington 34-27 to improve to 10-3. The Patriots are the third team in NFL history to win at least 10 games in nine consecutive seasons. New England joins the 1983-98 San Francisco 49ers (16 consecutive seasons) and 2002-10 Indianapolis Colts (nine) in accomplishing the feat. Patriots tight end ROB GRONKOWSKI had six receptions for 160 yards and two touchdowns. 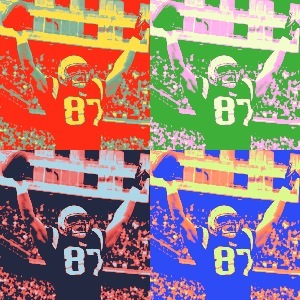 He has 15 receiving touchdowns, the most ever by a tight end in a single season. In his career, he has 25 receiving touchdowns in 29 games. Only four other players have reached 25 TD receptions in 29 games or fewer – BILL GROMAN (24 games), Pro Football Hall of Famers LANCE ALWORTH (27) and BOB HAYES (27) and RANDY MOSS (29). New England wide receiver WES WELKER had seven catches for 86 yards and a touchdown. He has 100 receptions and joined Pro Football Hall of Famer JERRY RICE and MARVIN HARRISON as the only players to have four 100-catch seasons. 3. The HOUSTON TEXANS defeated Cincinnati 20-19 to clinch the team’s first division title and playoff berth in franchise history. Houston rookie quarterback T.J. YATES passed for 300 yards and threw the game-winning touchdown to KEVIN WALTER with two seconds remaining. 4. Four teams – Atlanta (16 points), Jacksonville (14), Houston (13) and Arizona (12) – came back to win games in which they trailed by at least 12 points today. It marked the second time this season that at least four teams overcame 12+ point deficits to win games on the same day (September 18). That is the most such days in a season since 1984. 5. For the first time in NFL history, there are three quarterbacks with at least 4,000 passing yards through Week 14 – DREW BREES of New Orleans (4,368), TOM BRADY of New England (4,273) and AARON RODGERS of Green Bay (4,125). ELI MANNING of the New York Giants has 3,705 passing yards and can become the fourth 4,000-yard quarterback with 295 yards tonight versus Dallas. 6. New Orleans quarterback DREW BREES passed for 337 yards and two touchdowns in the Saints’ 22-17 win at Tennessee. Brees has 10 300-yard passing games this year, tied for the most in a single season (Brees, 2008 and RICH GANNON, 2002). Brees has thrown a touchdown pass in 40 consecutive games, the second-longest streak in NFL history (Pro Football Hall of Famer JOHNNY UNITAS, 47 games). 7. Atlanta rookie wide receiver JULIO JONES had three catches for 104 yards (34.7 average) and two touchdowns in the Falcons’ 31-23 win at Carolina. Jones, who had three catches for 131 yards (43.7 average) and two touchdowns in Week 9, joined RANDY MOSS (1998) as the only rookies in NFL history to have two games with at least 100 receiving yards, a 30.0+ average and two touchdowns.